Hoopty Rides: What is so great about K.E.M. Weber? What is so great about K.E.M. Weber? As a younger man, I used to really buy into the whole form follows function ethos, but after collecting a fair amount of mid-grade Danish Modern-this and Eames-like-that, I decided I was more comfortable with the threadbare looks of thinning oriental rugs and old oak that smells of oranges. What I liked in a museum or in the pages of a book was not necessarily the same as what built a comfortable, personal environment and it took a while to figure out that simple fact. K.E.M. Weber is a little like George Nakashima for me. 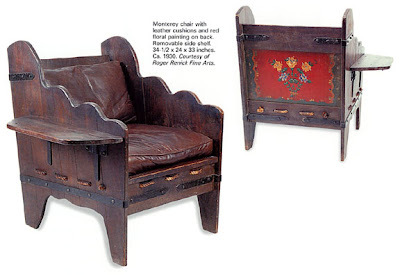 Beyond modernism, I just would be thrilled to be in the same room with a footstool by either Weber or Nakashima. Years ago, I was on a strategic hunting trip through the antique stores of East Sunset. Though I pride myself in finding hidden gems, I was with a real life, stone killer, serious collector friend with very, very deep knowledge. From across the room, He spotted a rather plain wardrobe that was so narrow it would hold a single winter coat and little else. That should have been the first clue that it was designed for sunny climates. My pal said, "I bet this is K.E.M. Weber" and, sure enough, he found a Disney Studios property tag on the back. Not only did I not peg it as Weber, as I had not even heard of the man. K.E.M. 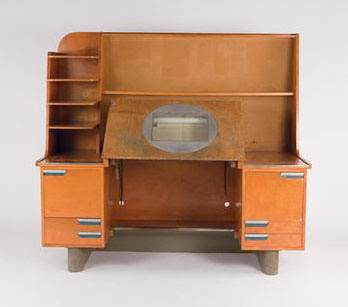 Weber was the main architect at the Walt Disney Animation studios and designed much of the animation department furniture therein. This is the timeless look of commerce. 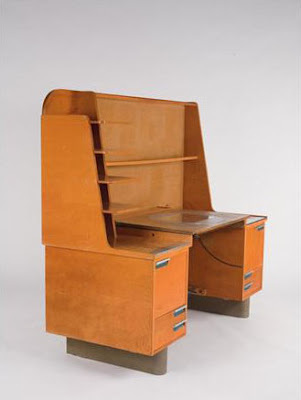 Imagine what it would do for the morale of the animators to show up each day and sit at this exquisite workstation. It is a fitting piece of furniture for the creation of animated masterpieces. K.E.M. 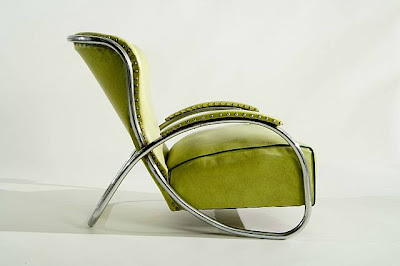 Weber was also an art director at Barker Brothers Furniture during the era when it seemed they could do no wrong. In a disparate styles than Weber's aesthetic, Barker Brothers also commissioned the Mason Furniture Company to design and build Spanish revival furniture for the stucco and red tile roofed homes being built in growing Los Angeles. Though the style was so different than Weber's, they share in common a romanticism of what California could be. While in Pasadena, I sometimes stop at Roger Renick to consider how soulful mass-produced furniture can be. Barker Brothers had a few things figured out. 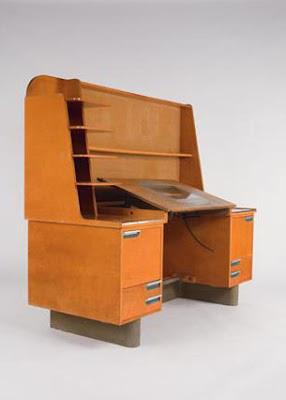 So, the Weber desk is at auction tomorrow. It is a live auction at LA Modern and also at trusty old ebay. Estimated at $6000-8000, but I bet it will sell for more.